For those with an appetite for atypical horror fare, Bailey’s range is satisfyingly wide. Bram Stoker Award nominee Michael Bailey has an ax to grind with horror fiction. In the disjointed Inkblots and Blood Spots, his latest collection to buck the genre’s blood-fests-and-madness conventions, he widens the scope of horror subjects, makes challenging stylistic choices, and invests his characters with an emotional weight that heightens the stakes of terror. The stories in Inkblots and Blood Spots engage with the macabre but also with sci-fi, fantasy, and historical fiction. Bailey features desperate parents, besotted children, harassed hit women, anemic carnival clowns, grieving pyromaniacs, even a bereft Dr. Frankenstein reimagined for the digital age. They meet fates by turns creepy, gruesome, sweet, and wholly mysterious. Referencing Einstein’s quote, “The only reason for time is so everything doesn’t happen at once,” Bailey begins with “Hiatus,” a surreal tale of a family man who makes a regrettable choice when he assumes he is the lone survivor of a time-stopping event. The sci-fi nail-biter “Bootstrap/The Binds of Lasolastica” follows, featuring a grieving scientist who convinces a dying man to undergo a mind transplant. In the vividly frightening “Underwater Ferris Wheel,” Bailey switches between second- and third-person narration, prolonging dread, as a mysterious carnival clown draws a boy away from his mother. And in the richly drawn “The Dying Gaul,” stanzas from Lord Byron’s early poem Childe Harold’s Pilgrimage are interspersed with an imagining of the passionate relationship between a violent gladiator’s female mistress and his boy lover. August – 79 lbs, 12 oz. September – 79 lbs, 3 oz. October – 78 lbs, 6 oz. November – 78 lbs, 0 oz. with their prismatic lips on the ground? Marrying art and poetry to text can help frame a collection. But despite a mini section on costumed characters and balloons, there is not enough pattern in tone, style, or content running through the stories for any real coherence. 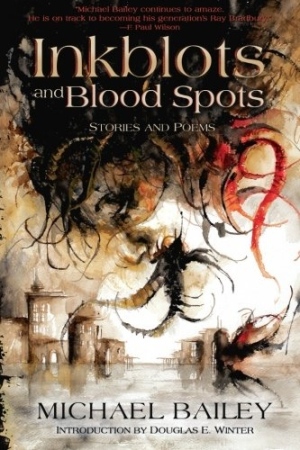 If Inkblots and Blood Spots is about anything, it’s about spotlighting Bailey’s range; and for those with an appetite for atypical horror fare, that range is satisfyingly wide.